For dinner we had breakfast. French toast. Eggs. Sausage. Yum. After dinner we went bowling. Some of us got a little competitive. Some of us whined about not knocking down enough pins in a frame. In total there were 24 strikes and 11 spares. No one got hurt. Amazing. The best part is we didn't have to leave the house. 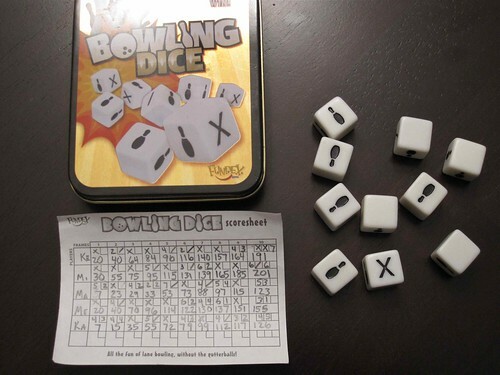 Bowling Dice. It's a fun family game. What games do you like to play? That sounds like a fun one! Chris and I love to play Farkle (another dice game) and Quidler or 5 Crowns.